The most fun dresses and skirts that can be worn through seasons and over years! These skirts started out as a way to use my stash of designer fabric scraps and have now become one of the top selling pieces from my spring/summer collection! 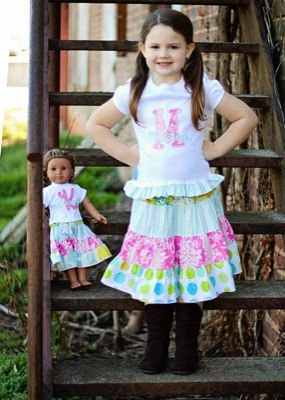 Each skirt is unique. 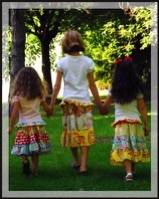 Made from ONLY designer fabrics that I will coordinate for you to create a 3 tiered long skirt. I use only the best fabrics from Moda, Michael Miller, Amy Butler, Heather Bailey etc. Available in sizes 2/3, 4/5, 6/7, 8, 10 and 12. Only $20.00!